Life is messy. It just is. Sin entered the world and broke it. Which led to broken people. My husband likens this to a mirror. When God created Adam and Eve they were like mirrors reflecting all the blessings God sent down into glory and praise and worship straight back up to Him. But when sin entered the world the mirror was busted. The blessings still come down from God, but the glory and worship and praise is fractured and going off in all different directions (picture light hitting a broken mirror) and we then worship and praise other things and not just God. We are a broken people with jagged edges. And what happens when you encounter a jagged edge? Typically it jabs you and it hurts. This could be physical pain where you actually do get hit, stabbed, bruised and it can also be emotional pain of harsh words, gossip, meanness, or bullying. Both pains can wound and cause irreversible damage, but in my opinion, emotional pain even that caused by physical pain is the hardest to heal. I heard one time, I don't even remember where, that people can be like sandpaper - they rub you the wrong way and it hurts to be around them. But quite possibly God is using that person in your life to smooth out some of those jagged edges we were talking about before. If we have a thick skin that allows everything people say to roll right on past, then we are opening up the door for pride to take root and closing the opportunity for people to point out those areas we need to work on. Another detriment for having a "thick skin" is the wall it places between you and other people. We were created for community and relationship, but if we keep our guard up all the time we are keeping ourselves from experiencing genuine, loving friendships. But life is messy. 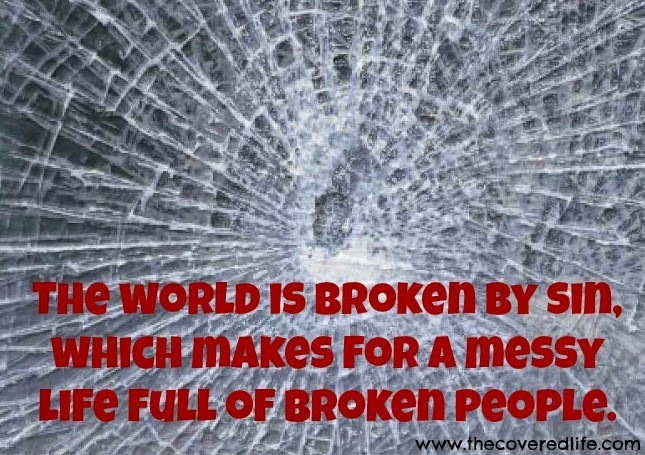 And though becoming a believer in Jesus Christ does repair our mirror as much as possible in this world (as we let it), we are still broken. We are still in need of grace and forgiveness. And we still need to extend the same grace and forgiveness to others. In all transparency here, I will tell you that this has been an ongoing process for me over the last 10 years. I have been hurt by many ugly words posted on social media, blogs, or even spoken to others and I started putting up walls. It hurt my ministry and it hurt my witness. Not to mention it's been down right lonely. But as one blog I read recently put it, I am ready to be more of a rubber band, allowing stuff to bounce right off instead of a rock that keeps everything out. Because the blog also pointed out that we are to be both a rubber band and a sponge. Using discernment (that you've already prayed for right) to know what you need to take in and what you need to ignore. And when we remember that people, even Christian brothers and sisters, are broken we can understand a little better why they jabbed us with a jagged edge, that they may not even recognize is there. And quite possibly God will use both of us as a sandpaper person that rubs (annoys :-) ) each other until the jagged edge is gone! **PS If you are here to check out information for the Autism Fundraiser I am sponsoring this month for Autism Awareness you can find that info here.